When you access or use the Site, Crossrider may use industry-wide technologies such as "cookies" and Flash (or similar technologies) which stores certain information on your computer ("Local Storage") and which will allow us to enable automatic activation of certain features, and make your experience on the Site and its services much more convenient and effortless. Also known as Adware.CouponPigeon, the application is a creation of Innovative Apps and 215 Apps. These companies have developed Download Savings, Coupon Cactus, Discount Dragon and other well known extensions which supposedly have been created to help you save your own money. Do you shop online frequently? Do you wish to find better saving deals? Then you may be attracted by the slogan of Coupon Pigeon – ‘Save more money when you shop online’. If you do not want unfamiliar third party companies to drop HTTP cookies on your browsers and record your online habits, you certainly do not need the suspicious extension running. What would happen if you disabled/removed the unwanted cookies? The suspicious program would no longer provide you with any benefits, which is why you should delete Coupon Pigeon altogether. 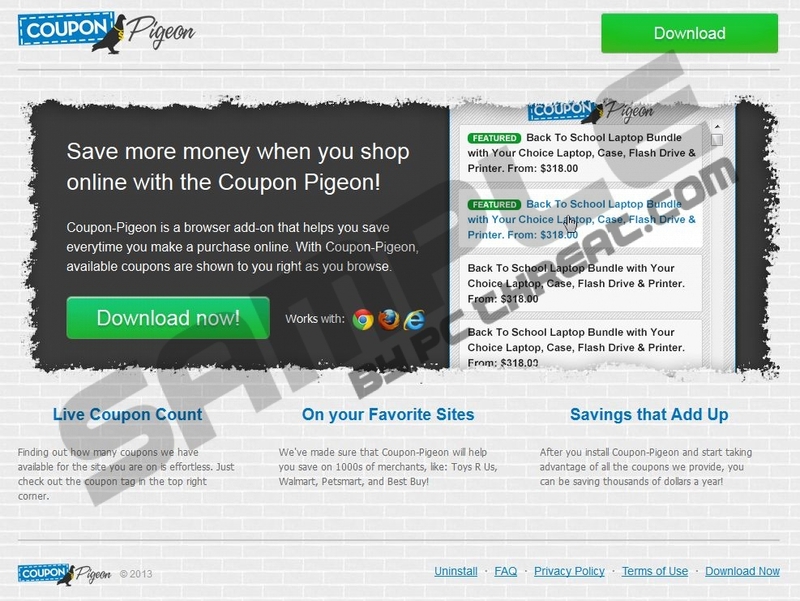 If you do not want to remove Coupon Pigeon manually, you should delete it using automatic malware detection and removal software. Alternatively, you can follow the manual removal instructions below. Once the task is complete, it is important to implement automatic malware detection and removal software to guard the system against future schemers’ attacks. How to delete Coupon Pigeon manually? Right-click the application you wish to remove and click Uninstall. In the Metro UI start screen right-click on the background. Select All apps and open Control Panel. To delete the undesirable program right-click it and select Uninstall. Quick & tested solution for Coupon Pigeon removal.